Muhammad Amir is very great and shining star in cricket world and. There is no compromise for his talent. He has survived pakistani team in every difficult and hard situation. Last edited by Abdullah719; 11th June 2018 at 13:16. I like his comments on Sarfaraz. I am sure Pakistan management is publicly backing him but privately, he is being told to figure his game out for the longer version. ISLAMABAD, June 11 (APP):Former captain Waqar Younis sees some good cricketers emerging from Pakistan Super League (PSL), but believes the tournament will not produce quality Test cricketers. He said cricketers need to be groomed and that process has to be done in domestic cricket. “PSL has received a lot of praise and credit for nurturing talent but domestic cricket also deserves some praise for producing good players,” Pakpassion.net quoted him as saying. He said Pakistan domestic cricket has not always received the credit it has deserved, but the fact is that it has been producing high-quality cricketers for nearly 70 years. Waqar said Pakistan domestic cricket can do more to help cricketers. “We are not quite there as compared to other nations’ domestic structures, the standard of their pitches and the standard of their domestic cricket and it definitely needs more attention,” he said. He said skipper Sarfaraz Ahmed needs to lift his game batting at number six if he is looking to play a young team with a couple of all-rounders. “Sarfaraz needs to take more responsibility and lift his batting in Test cricket. He is fine in the Limited-Overs formats but his performances with the bat have definitely dipped in Test cricket,” he said and added Sarfraz will battle it out. He said as far as Sarfraz’s captaincy is concerned in all three formats I would stick with him, but there is no harm in keeping your eyes open in terms of future replacements. Speaking of Shaheen Shah Afridi, he said he hopes Afridi stays fit as he is playing cricket at a very tender age. “They need to be very careful with him and not rush him into playing too much cricket. It would be better if he was groomed and prepared fully and not rushed into international cricket,” he said. He said Pakistan is now producing a generation of young, fearless cricketers such as Hasan Ali, Shadab Khan and Faheem Ashraf who have quickly found their feet in international cricket. “It is important for Pakistan cricket to ensure they are finding the talent from places other than the major cricketing cities. In the past players have come through from the not-so-well-known areas like Mushtaq Ahmed, Mohammad Zahid, Mohammad Irfan and myself,” he said. No cricket at home has absolutely nothing to do with Pakistan’s inability to produce genuine speedsters. I agree its a lame excuse. Even when we did have cricket at home from around 2003 to 2009, it was clear that apart from Shoaib and Sami, Pakistan did not have speedy prospects. But one contributing factor has definitely been slow, green wickets in domestic cricket which has perhaps been exacerbated by the declining standards of our grounds, pitches which the PCB has been unable to keep up after the absence of international cricket from Pakistan in the last 10 years. In the last 10 years you will see guys like Hammad Azam, Asad Ali, Anwar Ali topping domestic wicket taking charts and many experts on tv has mentioned many times that these guys are military medium. When a pacer in domestic cricket knows he can just trundle in and get easy wickets bowling at 120-125 km/hr then what is the incentive to bend your back and try to bowl in the late 140's. 150's. As for Waqar's and Shoaib's comments, these guys are just looking to protect their legacies with comments like "We will not produce speedy pacers all the time". They don't really want to put the work in to try and uncover them. This theory has been disproved over and over again. I can come up with numerous examples of ex-cricketers coming up with braindead suggestions and solutions. Just because you have played the game at the highest level doesn't mean that you are always right. I can come up with countless statements from legendary players that are completely rubbish. Pakistan haven't produced a quality tearaway fast bowler since Shoaib Akhtar emerged in 1996/1997. We stopped playing cricket at home in 2009 - what stopped Pakistan from producing tearaway pacers for 12 years? However, I would agree that the domestic pitches have played a role in diminishing the production of genuine speedsters. The domestic pitches are poor because of PCB's mismanagement. In my opinion, scheduling is the biggest issue - the tournament is held in October-January where the conditions are quite conductive to swing bowling, however, that should not stop the curators from producing grassless wickets. The idea that the curators are not under pressure to produce international standard wickets seems like a far-fetched excuse to me. The PCB has finally taken note of this problem and I believe we will see better wickets in the future. Same fast bowlers would have hard time reversing that much and that often today. This isn't true, the skill I believe has been lost. I suspect the team as a whole is no longer conscious of taking care of the ball as a unit for the pacers and the pacers are also not practicing and working hard on the art behind the scenes. Plus for reverse swing to be very effective, you need that x factor pace as well which apart from Wahab most of our pacers lack. Like with Dsoora, Bumpers(70s/80s era), reverse swing will never see the same peak as it has seen in 1990s, skill is only one factor, you cannot ignore first invention advantage, which we had ripped, but it cannot be a permanent benefit. Last edited by yasir; 12th June 2018 at 01:34. The lack of 90mph bowlers in Pakistan is a big concern - we are not producing them any more. It seems that a lot of the up and coming bowlers are more medium fast and concentrate on T20 abilities as that's where the cash is. Last edited by Saj; 12th June 2018 at 23:13. There is some wear and tear on him as he was playing international cricket at such a young age. It's not easy to come back after being out of the game for 5 years. You can't expect an 18-year-old kid to be out of the game for 5 years and then come back and be the same bowler and do the same things he was doing before his ban. This is all fine if he is not hyped to the moon based on his performance 8 years ago. Please explain why Pakistan failed to produce a quality tearaway fast bowler between 1996 and 2009.
between 96-2001 we produced Shoaib-Zahid-Sami. 3 in 5 years is a very good number. One got injured the other turned out crap is a different matter but the system did produce tearaways remember Waqar is talking about 90+ bowlers and not quality just 90+ bowlers then in 2008 Wahab came on the scene another 90+ bowler Amir pre ban was also 90+ watch his spells on the Australian tour in 2009 he was clocking 145-150. I do think its a myth that in 80's and 90's every domestic team had a 90+ bowlers otherwise Aaqib would not have been the 3rd best pacer in the country and we would not have seen countless chances given to Ata ur Rehman, Navved Anjum, Amir Nazir, Shahid ehboood Azeem Hafeez, Mohsin Kamal etc. Amir has had 3 years now to figure out his bowling, he on the other hand has been complaining of workload whereas Wahab and Junaid had been toiling away for Pakistan without any complaints and are still willing to play all formats for Pakistan. T-20's had already started from 2006 onwards so these excuses don't make sense. The reality is that he is not as good as people felt he was. That 2010 tour to England was deceiving in the long run, even RP Singh looked unplayable and the second coming of Wasim in those conditions. Sami, Wahab, Amir(18yr old), Irfan(to an extent) used to bowl 145kph plus consistently with Sami being the fastest I believe. Amir in Australia was consistently bowling over 150kph in Tests in 2010. Wahab's pace came later but he along with Starc, Johnson, Milne was consistently among the fastest in the world around 2015. In fact if anything the 5 year ban may have helped to prolong Amir's Career. If he had played so much cricket during his 5 year ban, god knows what kind of injuries he would have potentially suffered, he already had a stress fracture in his back as a teen and Mohd Zahid felt that playing too much cricket would have been too much for his brittle body. Look at how Junaid Khan has gone into oblivion ever since his injuries. Look at how Umar Gul's career ended after his knee surgery in 2013. 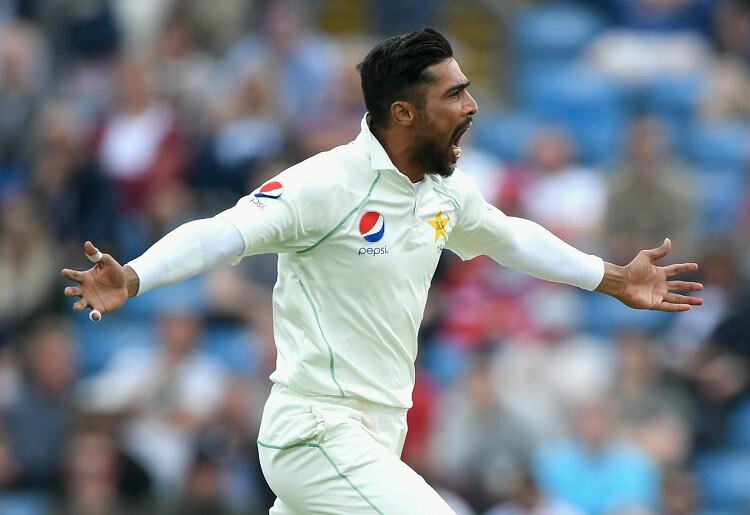 Bottom line is I don't see any major difference in Amir's bowling pre ban and now, sure yes having Asif around helped him to set up batsmen better but if you give this 2018 Amir the same bowling conditions that he enjoyed in the 2010 series he will look just as menacing and devastating as he did in 2010, but if you give the 2010 Amir the same flat wickets that the 2016 to 2018 Amir has had to bowl in most of the times, he would be just as ineffective. Bottom line is he isn't as good as we felt he is and his last series before his 5 year ban was extremely misleading. Or maybe the 5 year put halt to his progress.Amir was hyped even before that series a 18 yr old who was clocking 150 was exciting for everyone even though results were still not there till the last series.Amir has not remotely bowled close to how he bowled before ban and that includes matches other then his last series before ban. Give him a green top and he will look like the 2010 Amir in no time. Pakistan has never historically produced many tearaway fast bowlers, but the ones that were produced got identified and progressed to the national circuit. Playing in front of the home crowd was the motivation that was needed for the bowlers to bowl in fast, historically before the berth of t20 and franchise cricket. UAE was the death of our pace bowling and any bowler who goes there is ran into the ground. He should have been banned for life. It's criminal that he was allowed back in. There's nothing I dread more than seeing him in the team. Lol, I am pretty certain that people will keeping harping on and on about Amir being away from the game for 5 years even when he is in his 30's. If he's 'bowling the best he has ever bowled during his career' then surely Waqar's first point is moot? Well Mohammad Amir has been rested today for the opening match in the tri-series - makes sense.